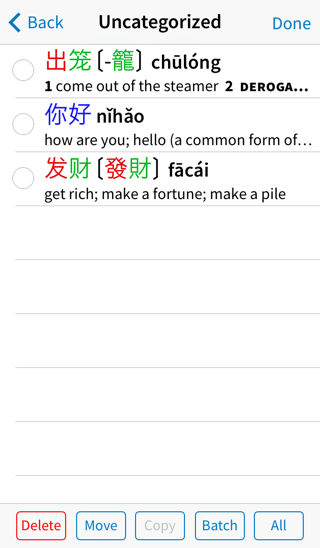 This tutorial will take you through the basics of using Pleco’s built-in flashcard system, which you can use to easily create / test yourself on lists of vocabulary words. 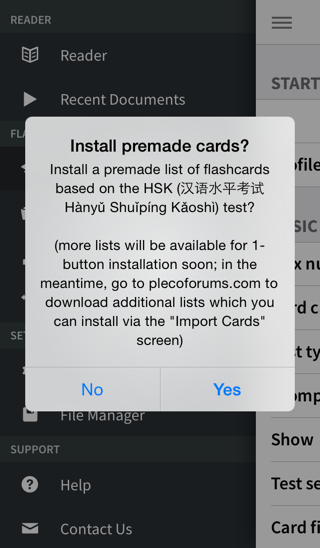 The flashcard module is a paid add-on; it can be purchased through the Add-ons screen inside of Pleco. 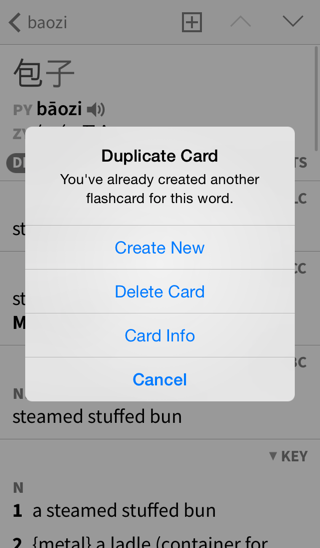 Pleco automatically checks to see if the card you’re creating is a duplicate of a card you’ve created before, and skips creating the new card if that’s the case. 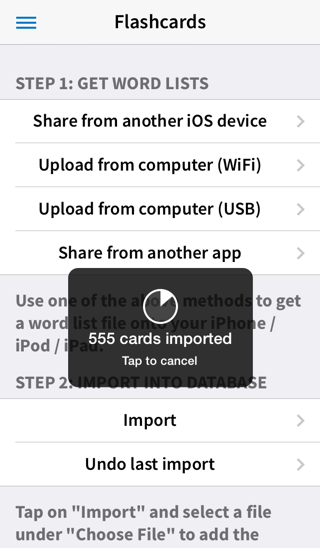 (you can change this behavior in Settings /Flashcards) You can tap “Delete Card” in this screen to delete that existing card, “Create New” to create it anyway, or “Card Info” to view / edit the card. 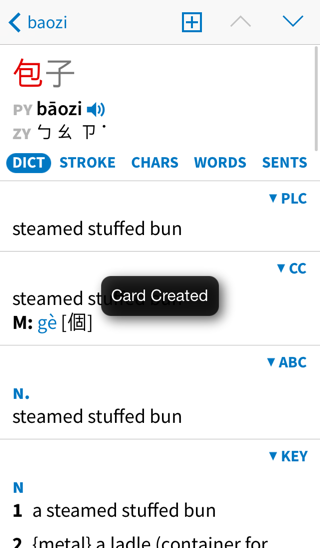 Look up a half dozen or so other words in the dictionary and create flashcards based on those, again using the Add Card button. 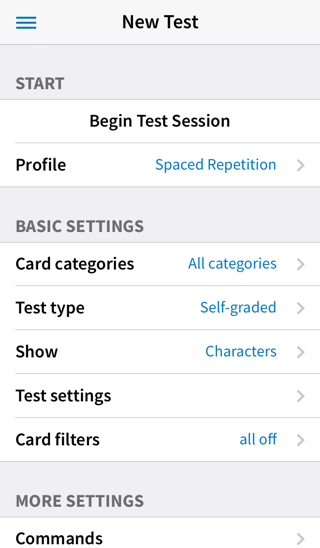 Select “5” for “Max number of cards” but leave Test type set to “Self-graded” and Show set to “Characters.” Tap on the Begin Test Session button to begin the flashcard test. 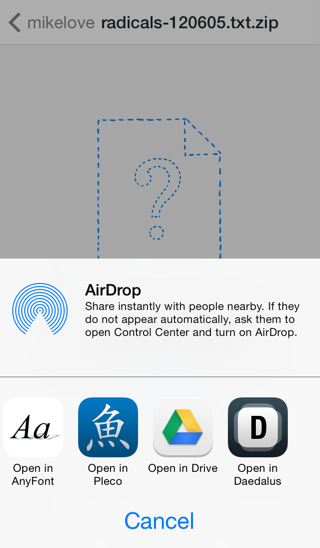 Tap on the mark correct button if you remembered the card correctly, or the mark incorrect button if you remembered it incorrectly. 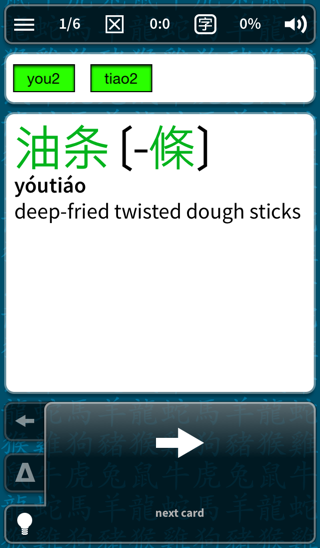 This will let you practice remembering characters instead of remembering their pronunciation / definition. 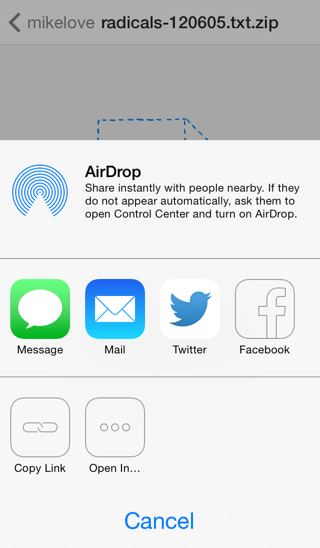 The Reveal / Correct / Incorrect buttons work just as before. 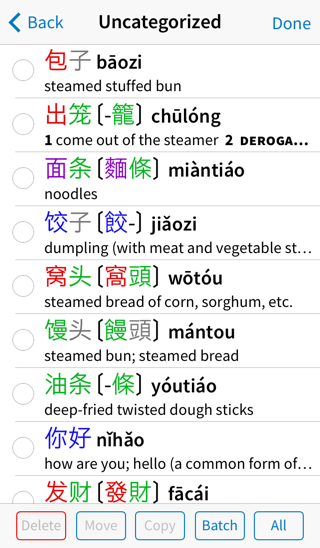 Cards normally come up in randomized order, so you won’t actually see 包子 come up first each time, we just used it for all of these screenshots. 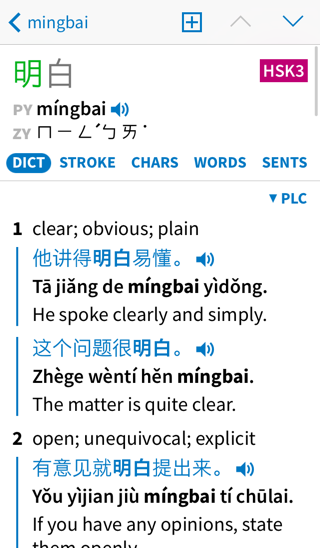 However, by default Pleco limits the number of not yet learned cards it will show you to 100 (changeable through the “Card selection” panel), in order to avoid overwhelming you with too many new cards at once; when a card becomes “learned,” which by default just means it’s been remembered correctly once, another new card is added to the pool of cards that Pleco will show you. 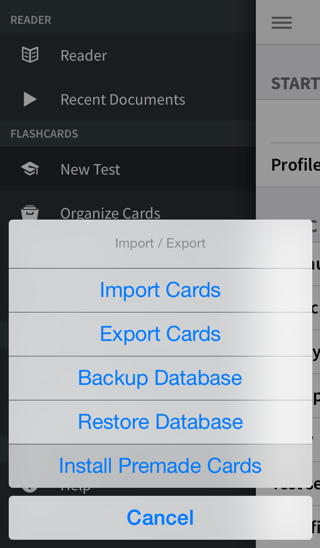 But if you create thousands of new cards through a flashcard import (see below), you don’t have to worry that you’ll be tested on all of them at once. 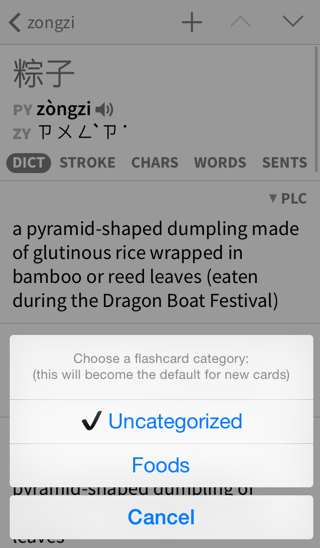 As your flashcard collection grows larger, you can keep it organized by using Categories. 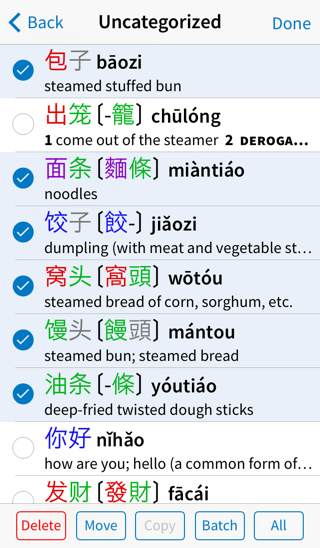 Categories are tags that can be applied to groups of cards to identify and organize them - you can create categories for textbook chapters, types of words (food, weather, transportation, etc), study-related groupings (like which words are going to be on the next class exam), linguistic classifications (slang or region-specific vocabulary), or any other system you can come up with. 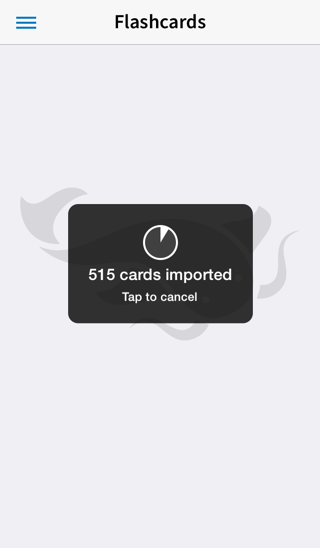 Each card can belong to an unlimited number of categories. 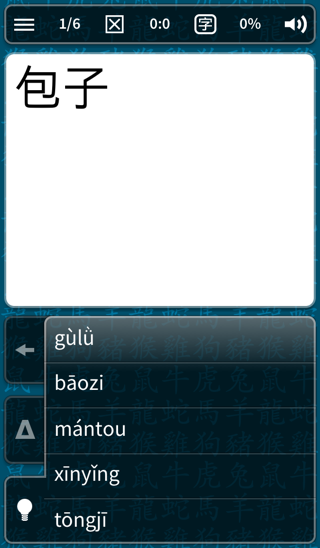 Tap on 包子 to select it; you can select as many cards as you want to move / delete / etc at the same time. 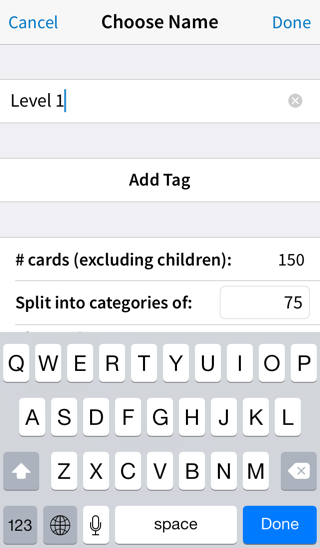 Tap on the category you want to add the card to. 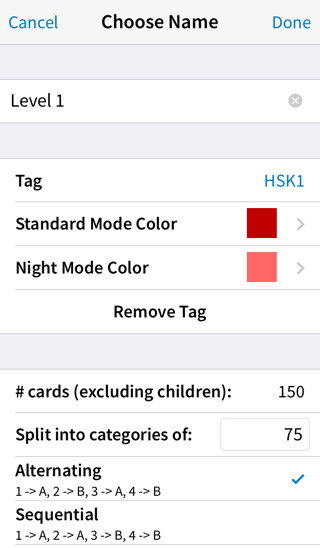 Additional taps on the button will also default to that category; tap-hold on the button again to select a different default category for new cards. 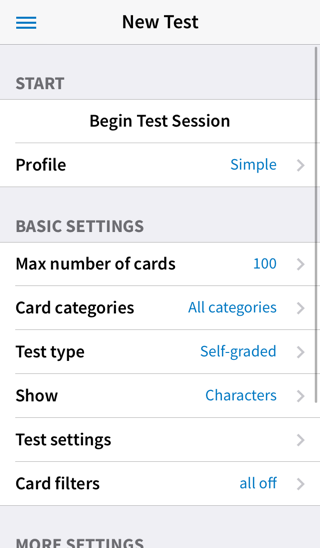 Once you’ve organized your cards into categories, you can choose which cards to review in a particular flashcard session based on their categories. 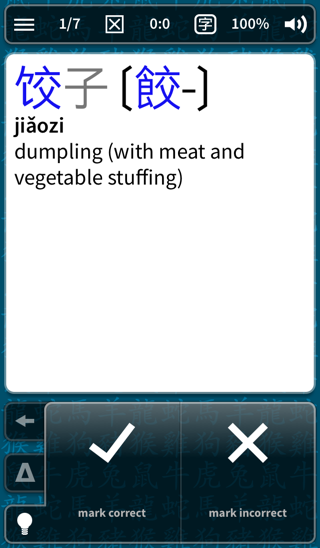 Tap on the “Foods” category to include cards from that category in the session. 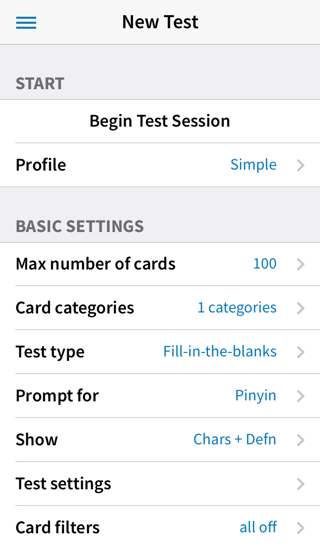 If no categories are selected in this screen, the session will include cards from all categories. 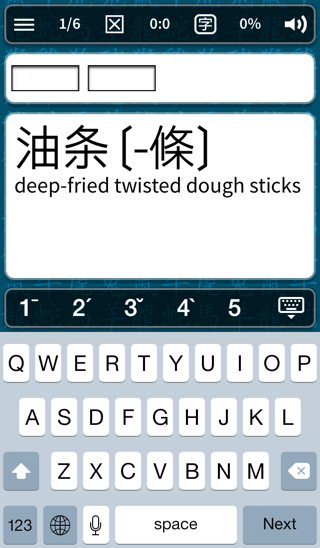 Draw the character in the large blue box, then tap on the correct character in the row of choices on the bottom of the screen, or tap on the screen with two fingers to clear your input if the first of those choices was correct. 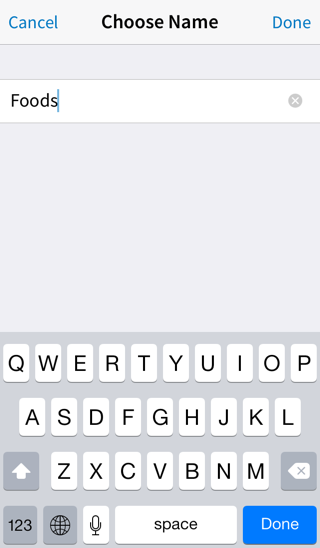 If none of the choices are correct, tap on the Backspace button to clear your input and try again. 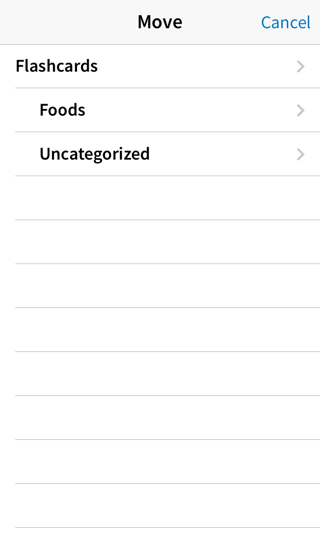 Once you’ve filled in all of the boxes, the system will automatically grade your answer correct or incorrect. 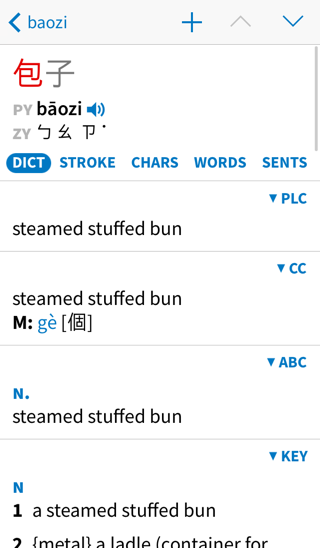 Instead of creating flashcards one at a time, it’s also possible to import an entire list of vocabulary words into Pleco and automatically create flashcards based on that list; many such lists are available on our website and elsewhere on the internet, including lists for several popular textbook series. 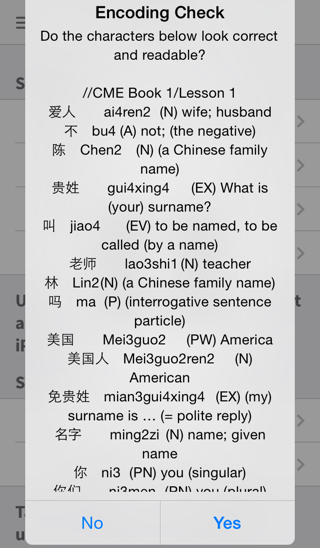 You can also import other flashcard lists into Pleco that are shared from friends / found around the internet. 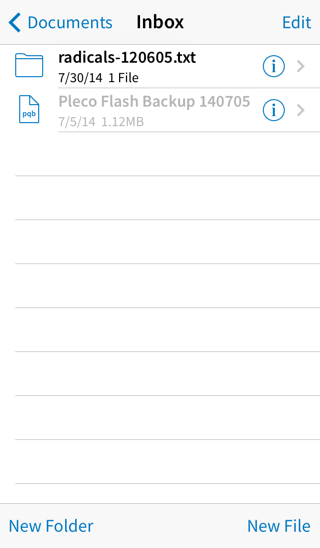 The Pleco “File Manager” screen gives you a number of ways to do this, but probably the easiest is simply to “open in” your flashcard list file from your favorite file-sharing app. 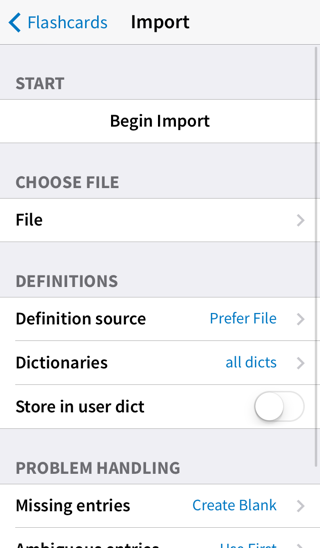 Assuming they are (i.e., they don’t look like random gibberish), tap on Yes to proceed with the import. 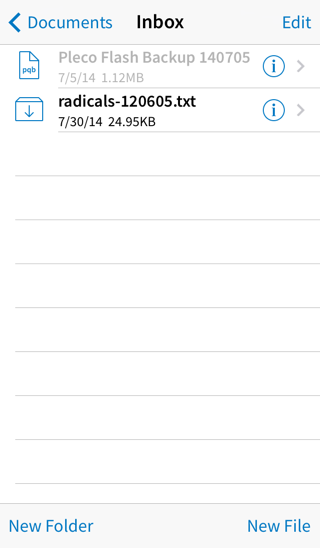 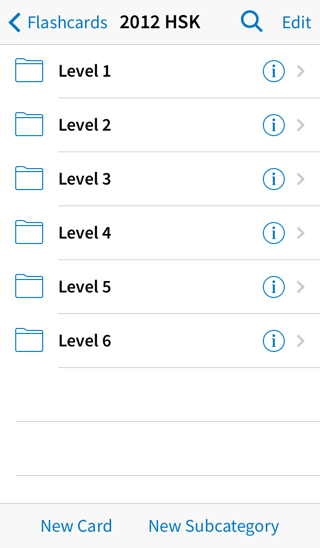 Go into the “File Manager” screen on two iOS devices and tap “Share Files” to wireless beam a file from one device to another. 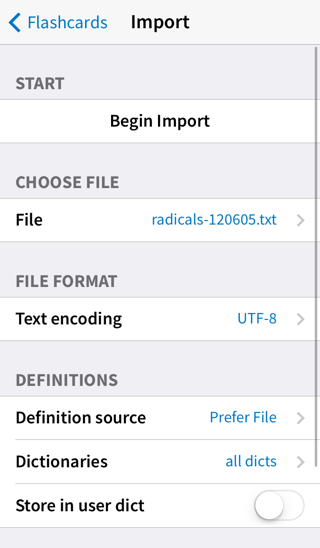 Go into “File Manager” / “Upload Download Files,” make sure “Enable Uploads” is turned on, then type the address under “Address Details” into your computer’s web browser and you can transfer files to your device through that interface. 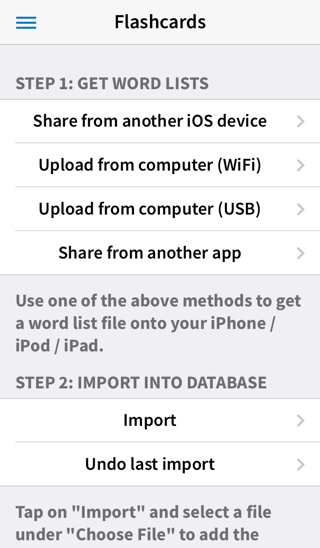 Connect your device to your computer with a USB cable, open up iTunes, tap on your device’s name at the top right corner of the screen, click on the “Apps” tab at the top of the screen, then click on “Pleco” under “File Sharing” (in the bottom half of the screen) and you can copy files to / from Pleco’s storage area on your device through that screen. 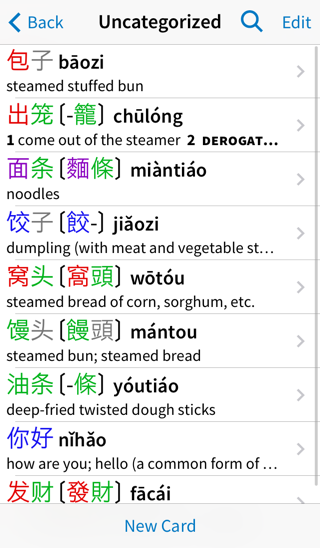 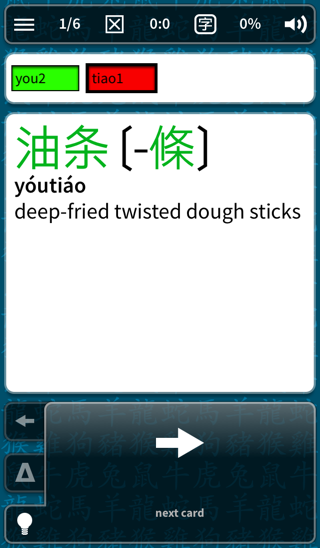 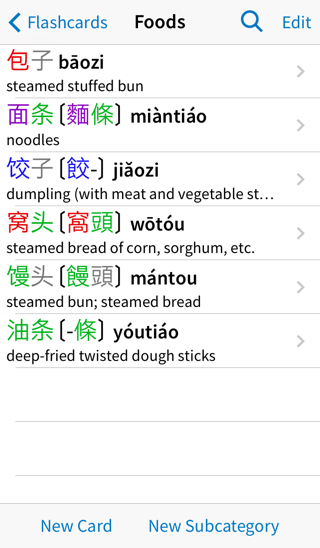 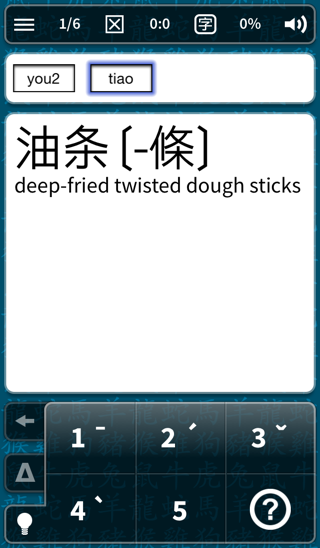 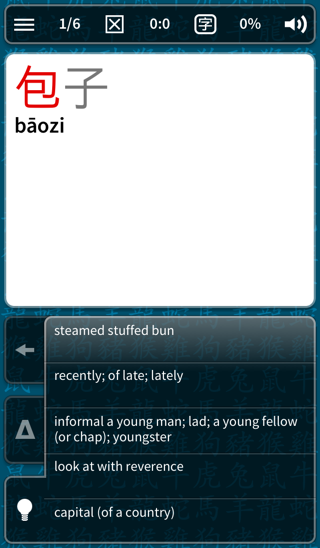 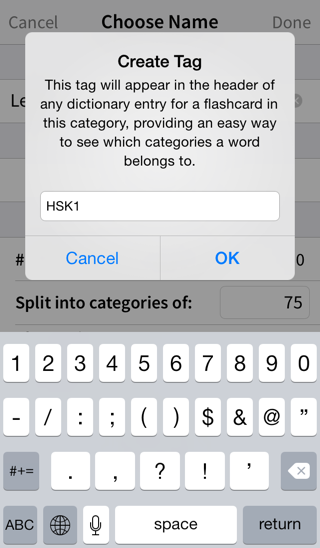 A flashcard system feature that’s especially useful when dealing with standard vocabulary lists like HSK is “Category Tags”; these will let you associate a short label / color with a particular category so that if a word is in that category it will show up at the top of that card’s dictionary definition, thus giving you an easy way to (for example) see that a word you encounter is in HSK Level 3 and hence is a popular word that you ought to learn. 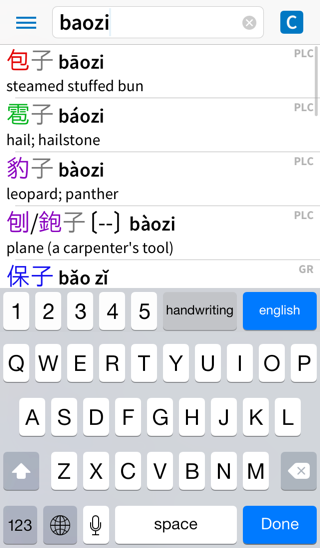 Now that you have a larger pool of flashcards, you can try a couple of other types of flashcard tests. 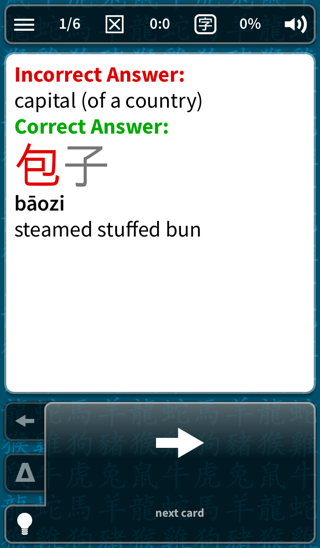 If you chose the incorrect pronunciation or definition, that will be shown at the top under Incorrect Answer, followed by the correct full text of the card under Correct Answer. 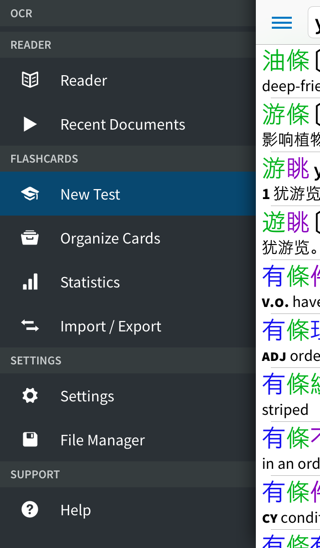 Pleco’s flashcard system supports the popular technique of “SRS” testing, where cards appear less and less often if you keep remembering them correctly in the hopes that these longer intervals between reviews will help you commit the card to long-term memory. 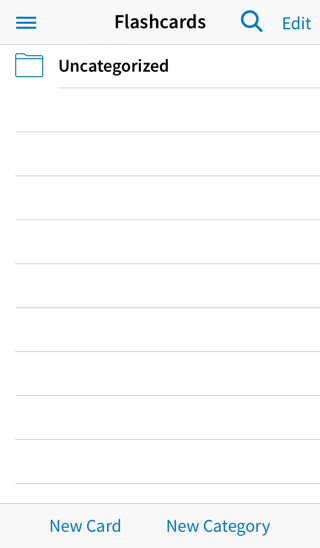 You’ll notice that the “number of cards” option has disappeared; with SRS, Pleco will show you however many cards you currently have due for study today. 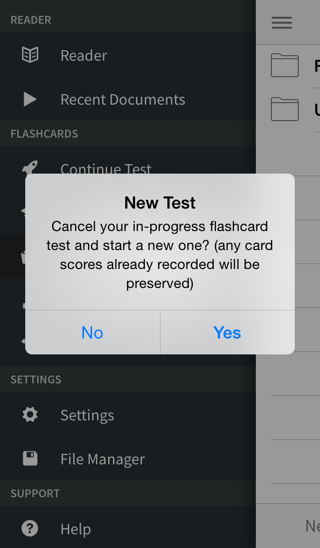 If you exit a flashcard test before you’ve finished, it will pick up with any remaining cards the next time you start a new SRS test. 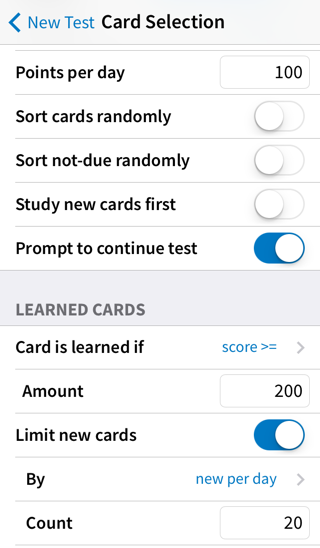 It’s important that you study all of the cards that you have due for review, since if you go too long between card repetitions you’re likely to forget the card and have to start over again with it. 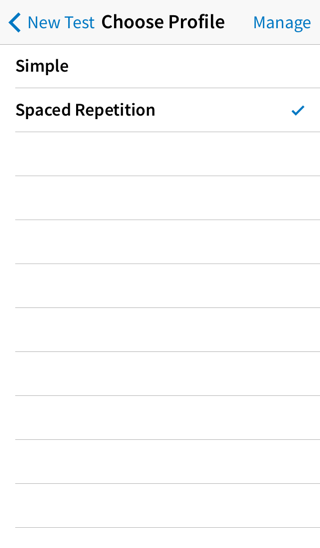 Another very useful option with SRS testing is “Repeat Incorrect” under “Commands” - this will let you repeat any cards that you answered incorrectly during a test at the end of the test. 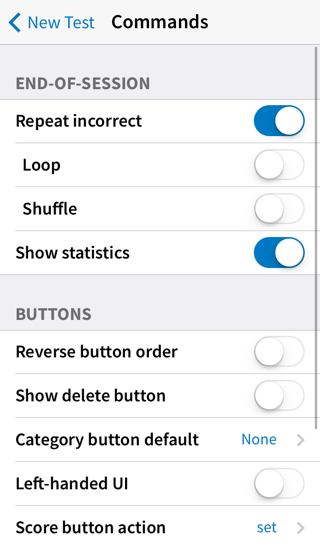 “Loop” will keep repeating them over and over until you get them all right, and “Shuffle” will randomize the order of cards for each of those loops. 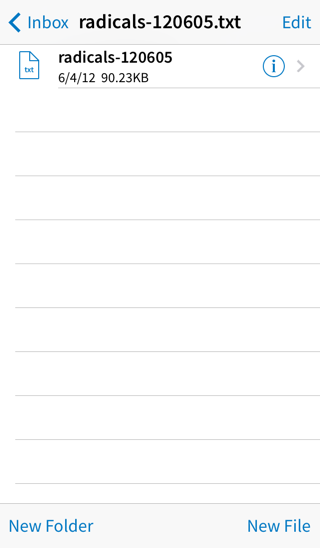 1) Set “points per day” to “50” - this will have the effect of doubling the time between reviews for each card. 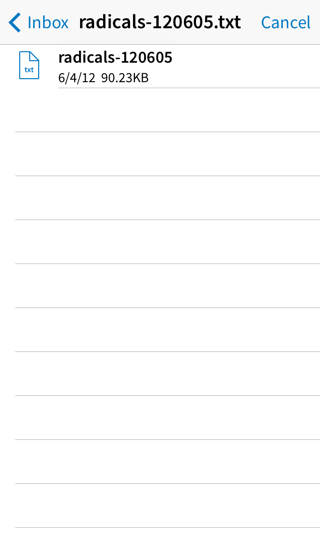 2) Set “limit new cards” “By” to “maximum unlearned” and set “count” to “1” - this will basically keep the system from introducing any more new cards until you change it, so you’ll just be reviewing your pool of old cards. 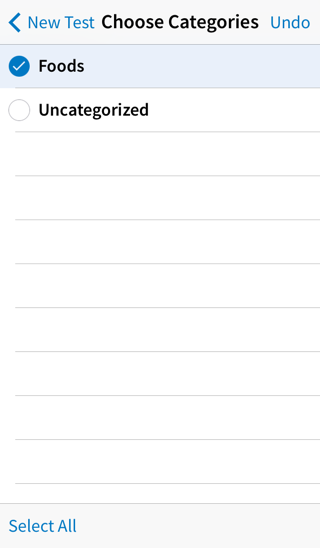 If all else fails, you can clear out all of your statistics and start over from scratch by going into Organize Cards and tapping Edit, Batch, making sure “all cards” is selected for “apply changes to” on top of the screen, and tapping “Reset all card statistics” near the bottom of the screen. 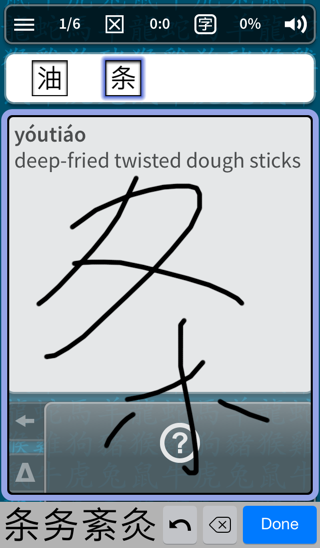 That concludes this tour of Pleco’s flashcard system. 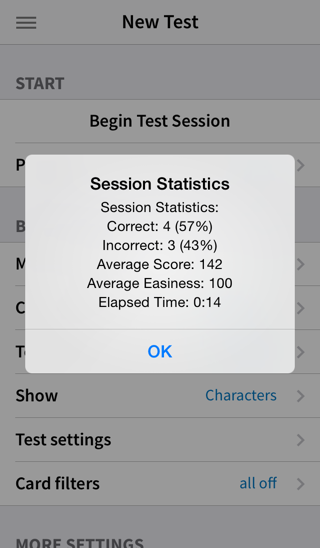 You can continue onto the final OCR tutorial, or see the flashcard Reference Manual for more detailed information on flashcards - some interesting features not covered in this tutorial are Stroke Order tests (work much better on iPad); the Statistics screen, which gives you information on how many cards you’ve studied and how well you’ve learned them; Profiles and Scorefiles, allowing you to easily save / restore sets of flashcard settings and track your progress on cards differently for different test types; and many other useful settings.